Are you satisfied with your smile? There have been many polls in which the majority of people reported that the first thing they notice about someone is their smile. At Weldon General & Cosmetic Dentistry, we are dedicated to maintaining the oral health of Ocala and surrounding communities. In addition, we recognize that esthetics play a large part in the satisfaction of the oral environment. Veneers are a terrific treatment for many different esthetic issues. Veneers are thin shells of ceramic or composite resin material that are bonded to the teeth. A veneer can be used to fix misshapen, discolored, twisted, chipped, or cracked teeth. The finished product can appear just like a natural white healthy tooth and can truly transform a smile. They can be utilized anywhere from a single tooth to the entire mouth to create a beautiful, dazzling smile. Veneers are often a terrific alternative to crowns. They are a much more conservative treatment utilized to change the color, size, or shape of a tooth. 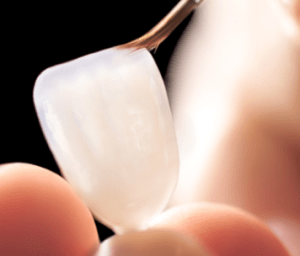 To crown a tooth, often a significant amount of natural tooth structure must be removed. By contrast, veneers usually are only used for the visible part of the tooth so less structure can be removed. Veneers can hide displeasing defects, like heavy staining from tetracycline or excessive fluoride ingestion, damage due to an injury, or as a result of a root-canal procedure. Unsightly gaps between teeth or teeth that are chipped or worn can benefit from this treatment. Many people are born with irregularly shaped teeth. Veneers can mask these teeth and provide a healthy looking smile. Although the shell is extremely thin, bonded veneers are extremely strong and can last for many years. Treatment planning, preparation, and bonding are the three major steps in placing veneers. The treatment plan will consist of you and your dentist discussing the desired outcome. The joint effort allows for you to properly convey your desires and for the dentist to utilize his/her expertise to properly attain the expected results. The teeth are then prepared by removing a small amount of enamel (usually one half of a millimeter) to allow for the thickness of the veneer. From there, the dentist will bond the veneer onto the tooth structure. Are There Specific Maintenance Requirements for Veneers? There may be a short period of adjustment to your “new” teeth, especially if the procedure was done to fix irregularly shaped teeth. It is important to care for veneers just as you would care for your natural teeth. Regular brushing and flossing should be exercised. Veneers are stain resistant but it is important to avoid foods, drinks, and behaviors (like smoking) that can stain the teeth. Veneers share some of the same indications as crowns and restorations. Because of this, each situation is considered separately. If you would like to discuss treatment options with Dr. Weldon, we would be happy to schedule you for a consultation electronically or by calling us at (352) 622-3236.